The USAID FAIR project in collaboration with EUAM has started a tour of Ukrainian cities to present judges and PPIO staff with tools and methods to improve communication with society. The aim is to open up the Ukrainian court system at all levels and enable dialogue, interaction and trust between judges and citizens. At the one-day seminars the judges and PPIO staff are taught crisis communication, building websites and engaging in social media, speaking to the camera and briefing journalists, just to mention some of the many topics. 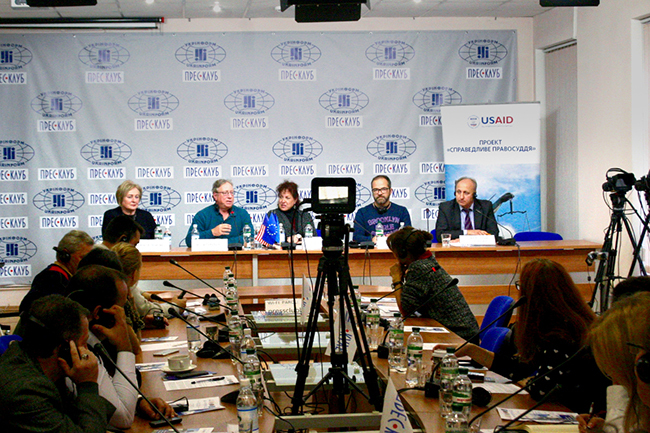 The tour started out in Lviv with a press conference for journalists and activists. Several people made it to the press event even though it took place on a Sunday afternoon, evidence that the interest in the topic of open courts is substantial in Ukraine. Among the questions that came up during the press event most focused on the evident disproportion in the interests of the media as opposed to the courts: the judge focuses on details, complex justifications and the overarching need for impartiality and fairness of the trial while the media mainly has a superfluous interest in the verdict itself, conflict, in-justice and getting the news out rapidly. Several other issues came up during the discussions. For instance witness protection, the risk of manipulation and undue influence by parties outside the courtroom, as well as the peril to the vulnerable parties in a trial if certain information makes it into the public. In sum, the road towards a transparent court system in Ukraine will not be easy, and every step on the way brings up difficult and sensitive questions. This said, the message from all those present was clear: both journalists and judges must maintain the pressure for openness and dialogue. Only by insisting to ask questions – even if they seem stupid – maintaining good faith in the process and continue to be curios will people begin to gain renewed trust in the courts in Ukraine.